Calcana heaters make heating indoor and outdoor spaces easy for both residential and commercial customers. Calcana outdoor overhead patio heaters have become one of our most asked for heaters. And they have been our #1 selling patio heater for the last 5 years, and for good reason. With the low clearance to combustibles and modulating heat range adjustability from low to high and anywhere in between, Calcana patio heaters give you the perfect heat desired for just about any weather condition. 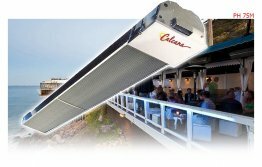 With a sleek, clean, stainless steel look and infrared heat, Calcana Heaters are the perfect fit for any home patio, restaurant, bar or resort. The same sleek look and technology is used in our garage and shop heaters, although they must be vented. A great fit for large garages and hobby shops alike. Calcana shop heaters are simple to install for the do-it-yourselfer. Unlike conventional forced air heaters which heat the air, our TUBE type infrared heaters only heat objects in the space. They consume up to 30% to 40% less fuel with adjustable heat, than conventional forced air heaters. Spend more time in your garage and get more done! Calcana commercial heaters are available in 11.6 feet, 16.6 feet and 21.6 feet lengths, all with the same sleek look and adjustable heat range, and must be vented. Keep your warehouse, airplane hangar or any commercial facility warm and comfortable. Increase productivity and reduce your heating bills by up to 30% to 40% when upgrading to a Calcana commercial heater from a conventional forced air commercial heater. Wonderful choice for your home patio and certainly restaurant outdoor dining patios. Available in both Natural Gas and Propane fuel sources. Can be mounted within 6" of any combustibles. Infrared waves heat the objects in the space, rather than the air. Consumes 30 – 40% less fuel than forced air heaters. Brackets for mounting on walls and ceilings. Perfect for garage or shop applications. Keep your shop comfortable all year around. Heavy duty heating. At home in large shops, industrial facilities and restaurants. 316 grade stainless steel for extreme environments. Perfect for facilities affected by salt water spray. © 2004 - 2019 Advanced Systems Company/DBA Gas Outdoor Patio Heaters. All rights reserved.